Anyone who has had or has ever been to an Indian wedding knows that they are not like other Canadian weddings. Indian weddings can last four or more days of festivities -- they really do become a marathon of sorts. 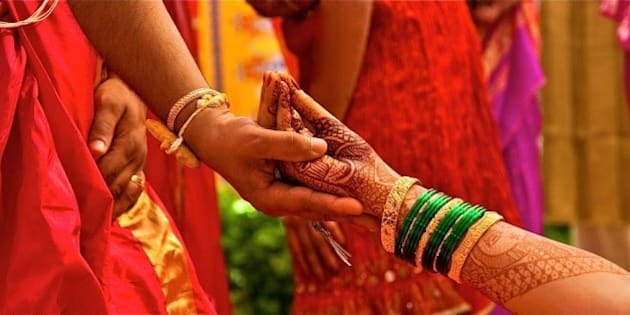 A traditional Indian Wedding, with lots of vibrant colors and fun, holding hands in this style is a part of ritual. :) Thanks to my best friends for inviting me for this wedding ! EXPLORED ! Anyone who has had or has ever been to an Indian wedding knows that they are not like other Canadian weddings. Indian weddings are good, bad and can get ugly. On one hand, you get to party with your family and friends every night for a whole week while you're all glammed up. On the other hand, you have to party with your family and friends every night for a whole week while you're all glammed up. Indian weddings can last four or more days of festivities. Between the engagement, sangeet, mehndi, out-of-towners welcome night, the ceremony and the reception, they really do become a marathon of sorts. Having a large family, I have run my share of Indian wedding marathons. As I age over the years and my feet and liver can tolerate less and less, I've learned some tips and tricks to make it through! It may seem that you're going to the same party, with the same people, at the same place every night. Varying your look will help liven things up and get you excited about getting ready night after night, with the added benefit of being able to distinguish one night from another in pictures. Do the clothes fit you? Do the shoes work with the outfit? Are the earrings too heavy? These are all issues you don't want to deal with as you're trying to get out the door. Try on all of your outfits with shoes and jewellery in advance, giving yourself enough time to find solutions to issues before the big event. Footwear is important to any endurance sport, and surviving five straight nights on a dance floor is no exception. Try not to wear the same shoes two days in a row so as to give your feet a bit of a break. Another key is to bandage up spots before you head out so that you can avoid blisters rather than treat them after the fact. Alternatively, rubbing a little deodorant on those spots acts like a barrier against the rubbing. On a side note: if you take your shoes off to dance, use wet wipes or some wet napkins to clean your feet before slipping your shoes back on. It doesn't matter if you're at the bar all night or if your drink of choice is chai -- hydrating is key to any marathon. Nights can be long and the venues hot and humid, which can result in your face sliding all over. Use face and eyelid primers before you apply your make-up; follow your make-up with a translucent powder or a finishing spray to keep everything in place. Evening bags tend to be small and by the time you fit your cell phone in there, you're not left with much room. I do, however, make room for some essentials. I use a small pillbox or old mint tin to contain a few bobby pins, safety pins, antacids and mints. I also like to carry a couple of wet wipes (see #3 above). If you don't have individually wrapped ones, you can always throw a couple in a Ziploc bag to avoid them drying out. Lastly, I always take my lipstick or lip gloss since that's the easiest way to refresh my make-up. We've all got our sore subject (school, marriage, kids, weight, etc.) and there's always an auntie who will hit you or your young adult child where it hurts. "Beta, don't you want a beautiful wedding just like this?" Despite wanting to tell the auntie to mind her own business and to worry about her own kids or weight, it's better to just pretend that someone standing behind the auntie is calling you and politely excuse yourself. We've all seen the poor soul at the party who is stumbling around with her sari slipping off her shoulder. Don't be that girl! Not only will you become fodder for auntie gossip sessions, you won't have time to recover since there's another event the next day. Keep track of how much you're drinking and alternate drinks with water. Nobody notices that pimple, the chutney stain on your top, or the uneven eyeliner. The one thing that will allow you to enjoy yourself and look amazing all night is confidence. So, hold your head up high, pull your shoulders back and smile! Follow up the week of excess by avoiding fried foods, butter chicken, dairy, alcohol, silk and embroidery -- it's not like you'll want any more of those anyway. As much as Indian weddings can be overwhelming, try to enjoy yourself. Before you know it, you'll be back in your sweats on the couch and engrossed in a marathon of the TV variety.